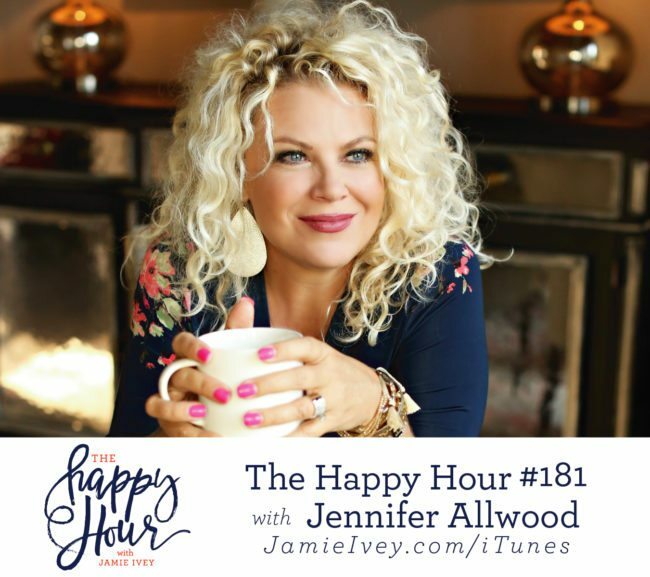 My guest for The Happy Hour # 181 is Jennifer Allwood. Jennifer is a wife, a mother and a creative turned business coach. She is “Facebook famous” according to her teenage boys with over 300K followers on that platform and she teaches women how to create a beautiful home and build a creative business. If you have been feeling God nudge you to do something new but you've felt afraid or uncertain, then this show is for you. No matter what stage of life you're in, I know you're going to be encouraged by our conversation today to get out there and use your giftings. Jennifer and I begin the show by discussing the joys and challenges of raising teenage boys including the new freedom she's loving with having a teenager in the house that can drive. Jennifer then shares how she transformed her painting business to a successful online platform. Through this shift, Jennifer has been able to reach an even broader audience than before, and she now also coaches thousands of women on how to maximize their talents through social media. She shares some of her tips with us and I know that I learned some things today that I'll be implementing ASAP! What I loved most about our conversation today was her encouragement for all of us. She reminds us that we all share the feeling of being afraid, but that doesn't release us from our calling. God has given us giftings and He has equipped us to use them, so don't let fear stop you when you feel him giving you a nudge!